Spring is finally here and what better way to blow off the winter cobwebs than rocking out at the Full Moon Dance! Back for another dance is freakishly gifted Lachy Doley! The super talented trio Hat Fitz & Cara will take you on a musical journey through time and London based Z-Star Trinity will blow your mind with soulful blues, roots and rock. Global Party People DJs will keep the outdoor garden pumping with those good hearty vibes! 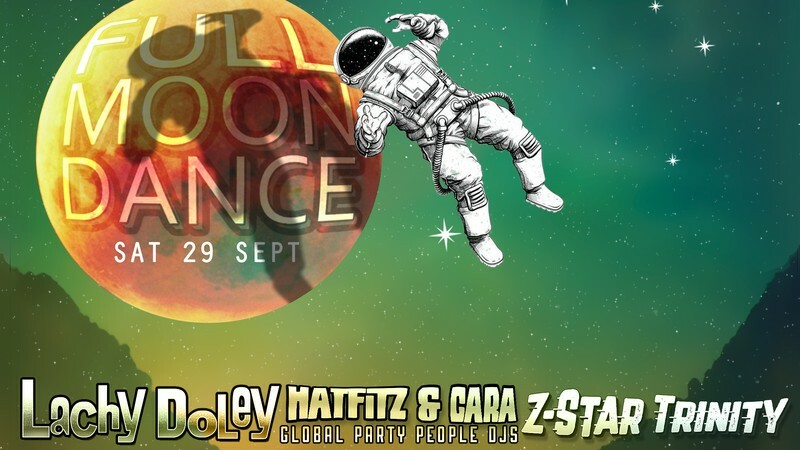 This Full Moon Dance will be an absolute treat! Lachy Doley is Australia’s most celebrated Blues Soul Rock Organ Player. He’s been dubbed the Jimi Hendrix of the Hammond Organ, a player who can pump, pamper and pound the most unbelievable sounds from a keyboard. The Lachy Doley Group are a unique sound in the classic and sometimes very traditional genre of the Blues. They have played over 200 shows and festivals since the first release in 2011 including Burning Festival, Rock In The Vines Festival, PEAK Perisher Festival, Echuca Blues, Noosa Jazz, Mitchel Creek Rock&Blues and were the stand out hit at the Gold Coast’s Blues On Broadbeach Festival for the last 3 years running. You’re in for a treat with this one! Hat Fitz & Cara’s musical style is a unique combination of folk, roots and gospel blues with old time flavourings reminiscent of a time once forgotten. Hat Fitz is a “veteran” wild man of the blues scene in Australia. He has a record 18 straight appearances at Byron’s East Coast Blues and Roots Festival, a record that is not likely to ever be broken! Although Cara is blessed with a sensational voice she was not content to be labelled as ‘just a singer’. She has taken to drumming duties as well as washboards, flute and tin whistle, sometimes all at once! Together this pair will take you on a musical journey with ample, boisterous highs, and longing, bluesy lows. From the Australian outback to the Canadian shield, Hat Fitz & Cara put on a show that is guaranteed to energize and invigorate. An interstellar ride with one of the most exquisite psychedelic rock goddesses around! London based trio Z-Star Trinity boast a new sound of blues, rock, psyche and soul. “Rolling Stone Magazine have proclaimed Z-Star as having the new sound of heavy soul and rock ‘n roll, and we can’t help but agree! Z-Star Trinity are a mind-blowing wall of sound that starts at level 100 and launches skyward from there! The outdoor garden will be packed with groovin’ beats from Global Party People DJs! Sri & Joakin bring ethnically diverse mixes and spiritually potent dance music together with live instruments and vocals sure to keep you dancing through the night. Unleash your free spirit and get caught up in the sound waves…and when you need a breather the Verrierdale Hall will have food and beverages available. All proceeds go straight back to the community so we can continue upkeep this amazing venue. This is licensed event, over 18’s only. Physical tickets available at Berkelouw Books Eumundi, The Drop Cafe Noosa Junction, New Earth Café Coolum & Little Shop of Soul Cooroy. There will be a limited number of tickets at the door (cash only).